The constraints and dynamics set by nature have a deep and significant impact on economic fundamentals and the ability to successfully manage renewable resources. However, the causal pathway from the natural to the social environment and its feedback for sustainable resource use is often overlooked, not the least because preferences and incentives are traditionally viewed as being stable and fixed. Yet, it is high time to take a new perspective: Social-ecological systems around the globe are under mounting stress and common pool resources are vital, in particular in developing countries. NATCOOP aims to establish how nature shapes preferences and incentives of economic agents and how this in turn affects common-pool resource management. 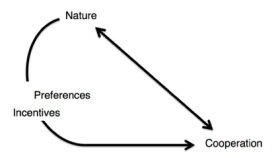 To this end, we investigate three mechanisms: (A) how tipping points and thresholds in the natural system may encourage cooperation; (B) how the volatility of resource abundance influences risk preferences and how this in turn affects community-based management; and (C) how social norms interact with the natural environment to foster cooperation that overcomes common-pool dilemmas. Accounting for the causal pathway from the natural to the social environment is challenging as one can neither assign “nature” as a treatment nor administer different management mechanisms. What we can do, however, is to push the research frontier by conducting economic experiments across different natural backgrounds. Fisheries in three countries serve as case studies: the fisheries for dagaa and nile perch at Lake Victoria, the pelagic and benthic artisanal fisheries in Chile, and the Norwegian fisheries for cod and herring. Methodologically, we develop instructive game-theoretical models and validate these by data analysis and economic experiments. With the funding of an ERC Starting Grant, we can repeat the field studies three times. NATCOOP opens a new perspective on cooperation in common-pool resource systems. Combining cases with different socio-economic and ecological background at three continents with theoretical and statistical work will contribute to this larger interdisciplinary research program. Ultimately, our hope is to identify circumstances in which natural preconditions and the social setting may go hand in hand to promote the sustainable use of renewable resources.